As a New Yorker, I (used to) believe there are but two types of bagels: those found in New York, and total, complete, abhorable garbage. Maybe it's the water! Maybe it's the tradition! Maybe it's just a misguided sense of East Coast urban superiority! (It's probably a mix of all three). But as I get older -- and my horizons expand along with my waistline -- I've realized the rest of our fair nation does indeed have quality bagel options… as long as you know where to look. And if you don't know where to look, look here, at one of these 12 spots. While some of these bagel shops do an admirable job of mimicking the "New York" style, others try (and succeed!) at blazing their own, distinct, breaded path to breakfast food glory. And while this list may represent the best of the best, it only proves that great bagels don't depend on water, tradition, or location. All that matters is that bagel makers have passion, use quality ingredients, and actually care about the product they produce. Oh, and they have to have holes. If they didn't, they'd just be rolls with fancy toppings. For any disgruntled New Yorker making a jump to the West Coast, two factors must weigh heavily on their mind: where will I find good pizza, and (perhaps more importantly), where will I find good bagels? For the first part of that specific transplant conundrum, Bagel Brokers has stepped in to make sure NY-caliber bagels are available to every kale-juice guzzling aspiring influencer in LA. 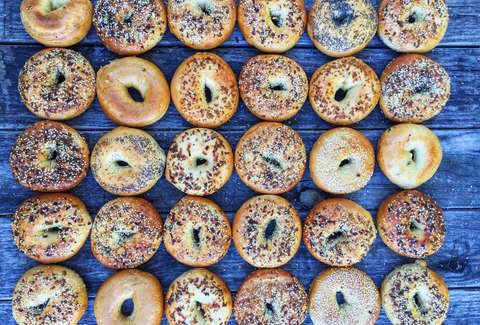 This family-run business, has been slinging homemade bagels since 1987, with every standard you'd find in a classic New York shop, mixed with West Coast influences (try their cheddar jalapeno, if you get the chance). 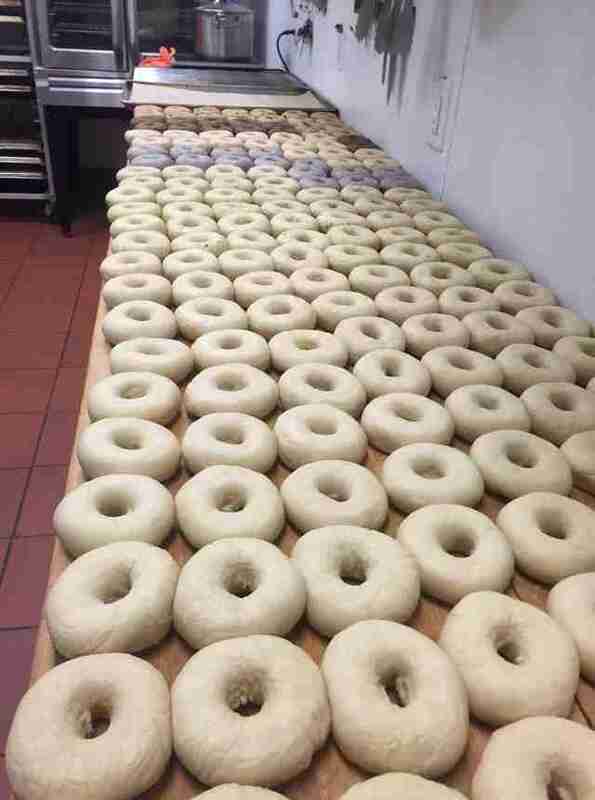 By 6AM, Bagel Brokers makes upwards of 2,500 bagels. By mid-afternoon, they are usually sold out. You can thank Bagel Brokers for blowing the diets of thousands of potential actors/models for three decades. Probably. As if the objective quality of Bialy's New York-style bagels weren't enough to warrant an inclusion (it is), the strict adherence to bare bones, bagel simplicity would be. You won't find toppings here. They just started accepting credit cards this year. Hell, they won't even slice their bagels for you. NY native Terry Skolnick founded Bialy's in 1966, after moving to Cleveland, finding a Jewish name in a phonebook, and asking them the best place to open a bagel shop in Cleveland (yes, seriously). 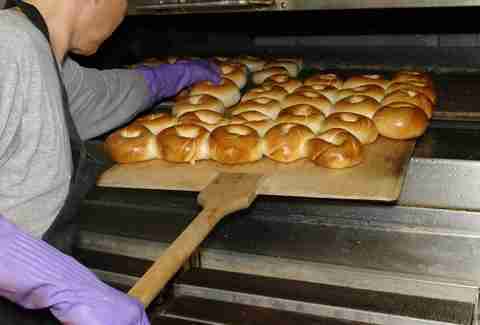 Since then Bialy's has become the bagel destination in Northeast Ohio. 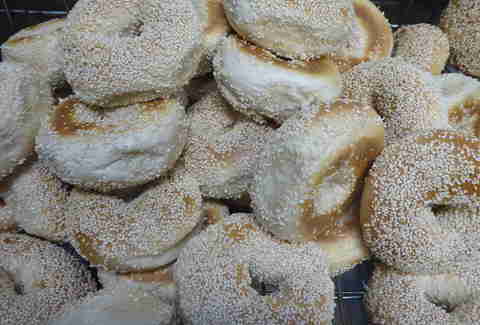 They city might have lost LeBron (again), but they'll always have Bialy's. The puntastic Wholy Bagel is yet again the result of a starry-eyed East Coaster, hell-bent on bringing quality bagels to desolate (at least in a bagel sense…) locales. In 2010, NJ-native Scott Campanozzi opened a bagel shop in the middle of Texas, complete with kettle-boiled bagels, breakfast sandwiches, Nova lox, and even Bronx-sourced Black and White cookies -- if you prefer your morning carbs to come partnered with even more carbs. It's the most New York thing about Austin… aside from never being able to find a cab when you really need it. Trust me: that's a bona fide compliment. Well, at least the first part. Despite being more than 30 miles outside of any major metropolitan area (in this case, the sprawl of Atlanta), BB's has certainly become one of the most iconic bagel shops in the American South -- an area that, admittedly, is not really known for their bagels in the first place. 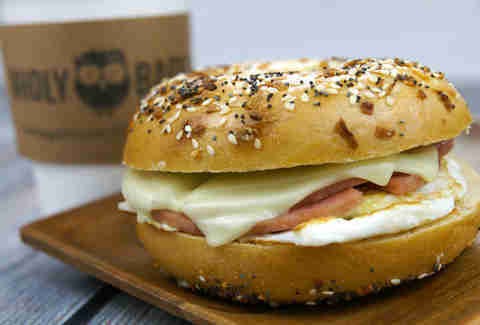 Still, these hand-rolled, kettle-boiled bagels can stand hole-to-hole (sorry) with any in the country. But BB's big distinction is their homemade, hand-whipped cream cheese, which "Some say it looks so pretty, like Gelato!" (their words, not mine) and come in flavors from "Horseradish Bacon," to "Kit Kat." They also have regular cream cheese, if that's more your speed. Boring. Part of their shtick -- and, perhaps what this Florida-based mini-chain is best known for -- is using a vat of "Brooklynized" water, which has undergone treatment to make it as close to "authentic" New York water as possible. Is it a Draper-esque marketing stunt worthy of the advertising Gods? Maybe. But that doesn't change the fact that their gourmet bagels look, feel, and -- most importantly -- taste like they came straight out of Flatbush. Factor in bacon, egg, and cheese sandwiches that taste equally New Yorkian, a corn beef bagel sandwich thicker than the line at Space Mountain, and you've got a breakfast joint that doesn't need really gimmicks to get people in the door. 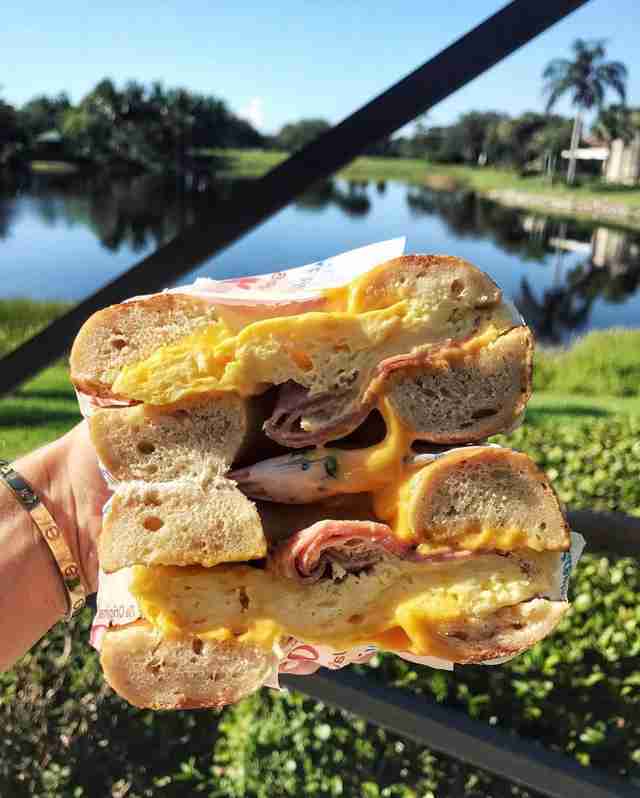 Quality bagels will draw the masses. Even in Florida. Kauffman's is much more than a bagel shop -- it's a full blown, Jewish delicatessen, that just happens to serve bagels, too. 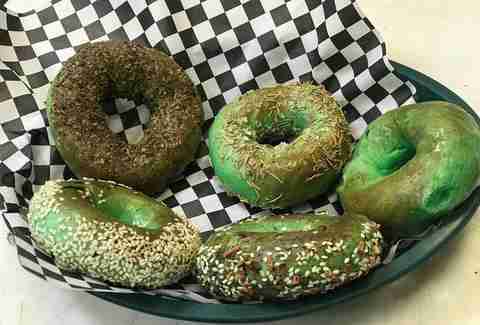 And these bagels just so happen to be the best of their kind in all of the Midwest. 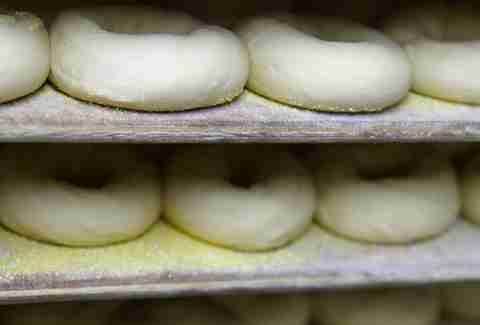 Their crunchy-on-the-outside, soft-on-the-inside bagels, baked fresh in-house since the bakery opened in the 1950s, commonly top lists like this. And it's hard to argue with Kauffman's pedigree. With any baked goods, and certainly bagels. Add some legit corn beef to your order, and you've got the best two things about New York, right in suburban Illinois. "Great bagels in Phoenix" may seem as out of place as "Winning sports franchises in Phoenix," yet here we are, with Arizona's own Odelay Bagels representing American Southwest with some of the best bagels in the entire country. Odelay uses hand-rolled bagels, boiled in malted water (a traditional, East Coast method), and serving with a spread of cream cheeses and toppings that would make any bagel shop this side of Atlantic Ave chive-green with envy. 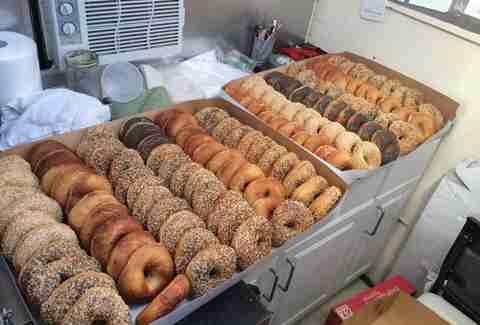 They set out, three years ago, to prove Arizona could indeed have a quality bagel spot. And I think, thus far, they've demolished that goal. Traditionally, people from Vermont truly love but three things: NPR totes, talking about how much better Vermont is than anywhere else, and Myer's Bagels. In at least one of those cases, they are wholly justified. 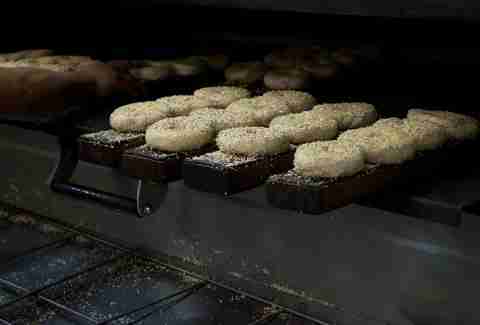 Myer's takes Montreal-style bagels, and bring them to New England: thin, chewy, boiled then baked in a wood-fired oven. Alongside classic flavors like sesame and poppy are idiosyncrasies that embrace the shops roots in Montreal and Vermont. In the first case, a Montreal steak-seasoning, and in the latter, a Maple Syrup-flavored. Oh wait, that's the one thing Vermonters love more than anything else. Bundy's is not unique on this list, as it is yet another story of someone trying to prove they can make quality New York-style bagels on their own, outside of the East Coast vacuum. It is, however, unique in Portland, as they actually do manage to make some truly amazing in the confines of the Pacific Northwest. They don't have any big secret: they hand-roll their bagels every morning, use only the best, freshest, locally sourced ingredients, and copiously coat their goods with poppy seeds, sesame seeds, and other traditional bagel accoutrements inside their diminutive shop -- which is really more of a cart. But, they do take their credentials to the next level with their (multilevel) lunch sandwiches. Damian Lillard himself could hardly dunk over one. 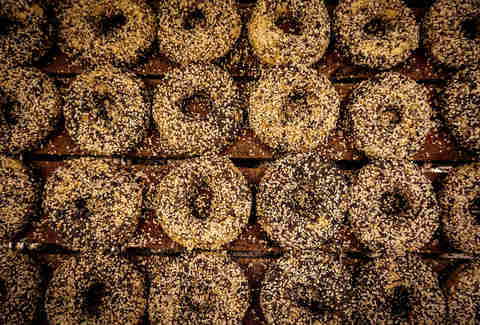 Despite sounding like an online school for bagel makers, this family-run bagel shop started off in an apartment kitchen -- before business blew up, and they decided to turn a 19th-century Corktown building into Michigan's premiere bagel shop. 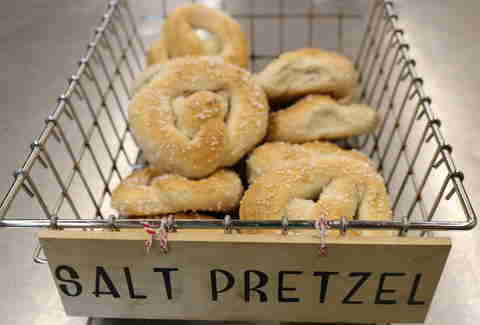 They boil their handmade bagels every day, and feature flavors varying from rosemary olive oil to jalapeño cheddar. And -- despite being untraditional -- they have a selection of bagel-ready jams to schmear on your bagel of choice. It's a serious name, for a serious bagel joint. We recently named this bona fide bagel shop and delicatessen one of the best small town restaurants in America. So, naturally, it has to be among the best bagel shops outside of New York City. Is it cheating a little bit that you can almost smell the garbage in New York City from Bagelmaster's sidewalk (it's about an hour drive)? Maybe. But, to quote myself, "The very arrogance that the name "Bagel Masters" touts should be an immediate disqualification. But despite the hurdles, Bagel Masters -- a bagel-deli-mecca as New Jersian as Bruce Springsteen in a Devil's jersey punching a BENNY while sipping on Orange Crushes in Sopranos-branded chilled mugs -- is the best small-town restaurant experience in the Garden State." And obviously, it's the best bagel shop in New Jersey.